Yosemite is a rock-climber’s paradise for granite and big wall climbing. It's impossible to miss the size of the walls when you drive into the park. The Park is a world-class destination as Yosemite boasts huge granite slabs up to 3000' (33-34 pitches including traverses). Given the exceptional natural beauty of the surrounding meadows, lakes, and forest, it's hard to imagine a better place to learn the fundamentals of rock climbing! El Capitan, Half Dome and Tuolumne Meadows are the major points of interest with countless other walls, and peaks up to 13,000 feet. The Cookie is good for short crack climbs. Manure Pile is a good multi-pitch climb. Buttress, just east of El Cap has three classic, straightforward routes: After 6, After 7, and Nutcracker. These can get pretty crowded so it's best to take them on early in the morning. Snake Dike on Half Dome is a dramatic moderate-difficulty climb. You pass two waterfalls and an alpine lake on the trail to the foot of Half Dome, from which you climb 800' along the southwest face of the rock. This full-day excursion includes a six-mile hike to the base, eight pitches of climbing and a 9-mile descent to the valley floor. It is one of the more popular climbers' routes in the park. Top Ropes; in the Valley, experts have recommended Swan Slab (behind the Yosemite Lodge next to the main road), Sunnyside Bench and The Church Bowl Area. 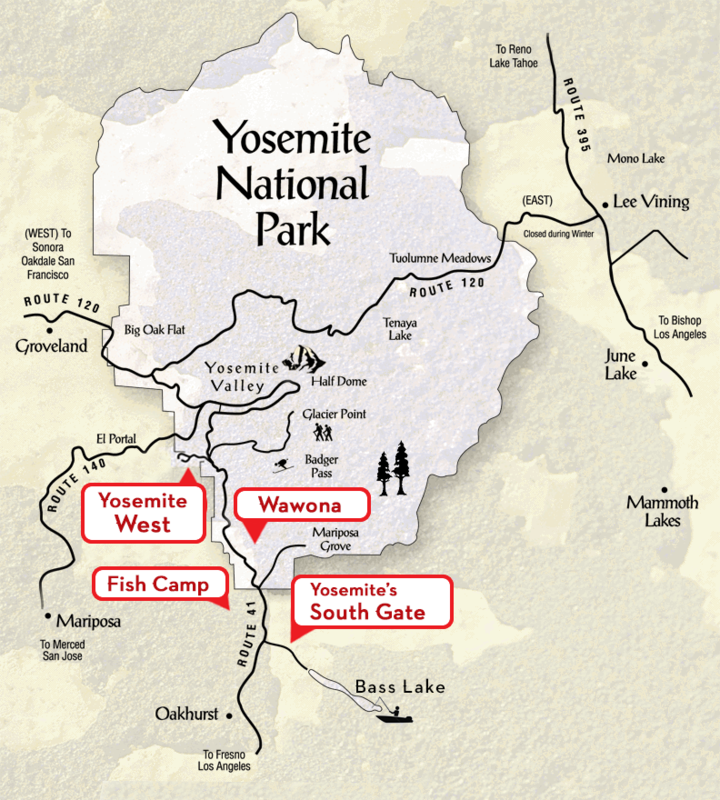 In Tuolumne, look for Puppy Dome, the West Side of Pot Hole Dome and Western Front near Daff Dome. The Yosemite Mountaineering School and Guide Service offers beginner through advanced classes in Yosemite Valley spring through fall, and in Tuolumne Meadows in summer. They are an American Mountain Guides Association (AMGA) accredited guide service and a Professional Ski Instructors of America (PSIA) member ski school. Climbing Clinics Our clinics and seminars are designed to give the intermediate and advanced climbers new and extended skill sets. Offered each year, these events occur on scheduled dates and fill up fast. Clinics cost $200 for one person; generous group discounts are available for two or more. Climbing Classes All of our climbing classes average 7 hours in length, unless otherwise listed, so be prepared for a full day of fun. Classes meet daily at 8:30 am at either Curry Village in Yosemite Valley or at the Mountain School in Tuolumne Meadows, depending on where you are scheduled. Reservations are strongly recommended. Our classes build upon each other and are designed to be taken sequentially, so that you can pick the single class you need, design the perfect multi-day seminar, or come up every couple of weeks and get our entire curriculum. Fees range from $217 to $235. Guided Climbs and Private Classes Guided Climbs and Private Lessons are available daily at all levels. All YMS guided climbs are really private lessons. In other words, we will give you as much information as possible along the way. Private lessons are a great way to get focused individual attention, where you determine the ratio of climbing to instruction. Reservations may be necessary and are always very helpful—At peak season we are often booked weeks in advance. Prices are based on the duration of the outing and the number of people in your group. Climb fees start at $221 for one person for 6 hours. Modern day climbing started when mountaineers were competing to become the first to climb the world’s top summits. With the lack of technological advancements we have today it was a huge accomplishment for them to survive let alone reach the summit. With such conditions early pioneer climbers chose the less difficult routes to the summit. As popularity grew and the sport matured, climbers looked for more complicated routes to scale to the top. This required time to practice and train, therefore the need to develop techniques and seeking locations to climb close to home. The cliffs, crags, buttresses, and gullies became their playground. They realized that this was not only fun or a method of practice but a sport in its own. Rock Climbing and Ice Climbing were formed. Years later they went indoor with their training during the winter months which also became popular and separate sport. One of the most breathtaking features in all of Yosemite National Park, and second only to Half Dome among Yosemite’s most recognized features. It has a short climbing history. In 1958 Warren Harding led an impressive climb that lasted weeks, and became the first to aid-climb the 3,000 feet of vertical rock. Harding’s monumental route up the prow became known as The Nose and started a new revolution in climbing. In 1961 Royal Robbins, Chuck Pratt and Tom Frost focused on another part of the wall called the Salathe Wall which was named by Yvon Chouinard in honor of John Salathe, one of Yosemite’s early pioneers. The Salathe Wall climb established the Golden Age of Yosemite climbing and set the fundamental framework for a generation of climbers that persists today. Spend your Yosemite vacation with Scenic Wonders. Over 70 big wall routes have been established on El Capitan’s Southwest and Southeast faces. Most of these are variations connecting two or more of the earlier established routes. There are dozens of climbers making their way up one of the established routes at any given time from spring to fall. Ascents have been made in as little as 2 hours and as long as 200 days, but the average party takes 4-6 days to make their way up, hauling 100 lbs of gear, food, and water for each member. Tourists, friends, and loved ones park along Northside Drive and picnic in El Capitan Meadow while watching the climbers from below.